Skylon is expected to slash the cost of launching satellites into orbit more than 10 times. Critical tests have been completed on a revolutionary rocket engine that could send astronauts into orbit and accelerate aircraft to five times the speed of sound. The British company heading the Sabre project said it was ‘the biggest breakthrough … since the invention of the jet engine’. Engineers at Reaction Engines Ltd (REL) overcame a major technical obstacle that has held back progress on the engine for three decades. It meant designing a system that could cool air entering the engine from more than 1000C to minus 150C in less than a hundredth of a second – six times faster than the blink of an eye. Tests evaluated by the European Space Agency (ESA) have now confirmed that the problem has been solved, allowing the Sabre engine to enter the next phase of development. 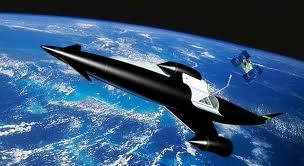 The engine is specifically aimed at Skylon, a new type of reusable space plane designed by the Reaction team. Skylon would take off from a runway like a normal aircraft and have the ability to carry a 15-tonne payload into low Earth orbit. After landing, it could quickly be turned around for another launch. Sabre engines could also power a new generation of Mach 5 passenger jets, cutting the flying time from the UK to Australia to less than four hours. Alan Bond, who founded Oxfordshire-based Reaction Engines and has led the project from the start, said: ‘These successful tests represent a fundamental breakthrough in propulsion technology. ‘Reaction Engines’ lightweight heat exchangers are going to force a radical rethink of the design of the underlying thermodynamic cycles of aerospace engines. ‘These new cycles will open up completely different operational characteristics such as high Mach cruise and low-cost, reusable space access, as the European Space Agency’s validation of Reaction Engines’ Sabre engine has confirmed. ‘The REL team has been trying to solve this problem for over 30 years and we’ve finally done it.